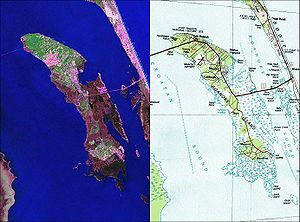 Maps of Roanoke Island taken from the U.S Geological Survey and the U.S Department of the Interior and NASA. Roanoke Island ( /ˈroʊəˌnoʊk/) is an island in Dare County on the Outer Banks of North Carolina, United States. It was named after the historical Roanoke Carolina Algonquian people who inhabited the area in the 16th century at the time of English exploration. About 8 mi (13 km) long and 2 mi (3.2 km) wide, the island lies between the mainland and the barrier islands near Nags Head. Albemarle Sound lies on its north, Roanoke Sound on the eastern, Croatan Sound on the west, and Wanchese CDP lies at the southern end. The town of Manteo is located on the northern portion of the island, and is the county seat of Dare County. Fort Raleigh National Historic Site is on the north end of the island. The island has a land area of 17.95 square miles (46.5 km2) and a population of 6,724 as of the 2000 census. The residents of Roanoke Island are governed by the Dare County Board of Commissioners. They are located within Congressional District 1 of North Carolina. The name of Roanoke Island comes from the Roanoke who originally resided on the island for at least 800 years prior to the coming of the English in the New World. The meaning of the word Roanoke itself is derived from the Powhowten language which was geographically close to the Roanoke. Roanoke means "white beads made from shells" or more literally ("things rubbed smooth by hand"). White beads were used as ornaments and currency for the Coastal Algonquin peoples of Virginia and North Carolina. One of the first governors of Jamestown, Virginia, John Smith records the usage of the word Rawrenock in the Algonquin Powhowaten language. In the context of the quote, Rawranoke refers to the items being traded, not people. Roanoke People, were therefore known for the trade of shells that are part of Roanoke Island and the other barrier islands of the Outer Banks. The Roanoke People may have created and exported the white beads and shells abroad. Roanoke Island was the site of the Roanoke Colony, an English settlement initially established in 1585 by Sir Walter Raleigh. A group of about 120 men, women and children arrived in 1587. Shortly after arriving in this New World, colonist Eleanor Dare, daughter of Governor John White, gave birth to Virginia Dare. 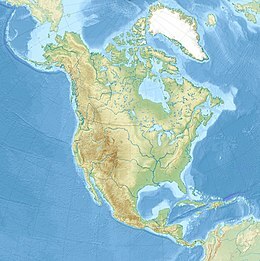 She was the first English child born in North America. Governor White returned to England later that year for supplies. Due to impending war with Spain, White was unable to return to Roanoke Island until 1590. When he arrived, the colony had vanished. The fate of those first colonists remains a mystery to this day and is one of America's most intriguing unsolved mysteries. Archaeologists, historians, and other researchers continue to work to resolve the mystery. Visitors to the Fort Raleigh National Historic Site can watch The Lost Colony, the second-longest-running outdoor theatre production in the United States, which presents a conjecture of the fate of Roanoke Colony. See also Roanoke People and Croatan People. Watercolor by Englishman John White of the natives of the Roanoke Peoples. Notice the water in the background. Archaeological discoveries at the Tillett site of Wanchese, North Carolina have dated the human occupation of Roanoke Island's land at 8,000 B.C. At the time Native Americans across North America were developing in the Archaic Period. Archaeologists discovered that the land of Roanoke Island was part of the Mainland when it was first inhabited by the first Native Americans. For thousands of years the development of Native Cultures on Roanoke Island corresponded with cultures occurring in the Coastal Plain of North Carolina. Around the year 400 AD the area experienced environmental transformation. The sand dune of Roanoke became disconnected from the mainland by water, and inlets in the Outer Banks turned fresh water sounds ( lagoons) into brackish ecosystems. From approximately the years 460 AD to 800 AD the Mount Pleasant Culture had a village on the Tillett Site in southern Roanoke Island within the modern day Wanchese township. After the year 800 AD the village was occupied by the Colington Culture, the Colington Culture was the predecessor to the Roanoke Tribe who were encountered by the 1584 English Expedition. Roanoke Island was the site of the 16th-century Roanoke Colony, the first English colony in the New World. It was located in what was then called Virginia, named in honor of England's ruling monarch and "Virgin Queen", Elizabeth I. From 1584 to 1590 there were six expeditions to the area and two groups of colonists who attempted to establish a colony there, both groups failed. When the English first arrived in 1584, they were accompanied by a Croatoan native and a Roanoke native respectively called Manteo and Wanchese. The two men make history as the first two Native Americans to visit the Kingdom of England as distinguished guests. For over a year they resided in London. On the return journey the two natives witnessed English piracy plunder the Spanish West Indies. Manteo and Wanchese had different reactions to the English, Manteo took great interest in Western Civilization. Manteo learned the English language and helped Harriot create a phonetic transcription for the Croatoan language, the Croatoan transcription was later destroyed in the Great Fire of London 1666. By contrast, Wanchese came to see the English as his captors; upon returning home in 1585 he incited his people to resist colonization at all costs. Despite the Lost Colony story line there is no documentation that Wanchese became a leader of his people. The legacy of the two Indians and their distinct roles of collaborators and antagonists to the English inspired the names of Roanoke's towns. As a result, when Sir Francis Drake put in at Roanoke after attacking the Spanish colony of St. Augustine, the entire population abandoned the colony and returned with Drake to England. Sir Richard Grenville later arrived with supplies only to see Lane's abandoned colony. Grenville left fifteen soldiers to guard the fort who were killed or driven away by a Roanoke raid led by Wanchese. Grenville returned to England taking with him the Native American Raleigh. The discovery of Croatoan by Sir Walter's Raleigh Expedition painted by John White. Croatan is a nearby island on the Outer Banks, but it could not be investigated due to an approaching hurricane. In 1587, the English now led by John White tried to settle in Roanoke Island again. At this time the Secotan Tribe and their Roanoke dependents were totally hostile to the English, but the Croatoan remained allies. Manteo remained aligned with the English and attempted to bring the English and his Croatoan tribe together, even after the newcomers mistakenly killed his own mother- who was also the Croatoan chief. After the incident Manteo was baptized into the Anglican Church. Manteo was then assigned by the English to be representative of all of the native nations in the region, this title was mainly symbolic as only the Croatoan nation followed Manteo. John White, father of the colonist Eleanor Dare and grandfather to Virginia Dare, the first English child born in the New World, left the colony to return to England for supplies. He expected to return to Roanoke Island within three months. "CROATOAN" was the name of an island to the south (modern-day Hatteras Island), where the Croatoan people, still friendly to the English, were known to live. The 1587 colonists might have tried to reach that island. However, foul weather kept White from venturing south to search on Croatoan for the colonists, so he returned to England. White never returned to the New World. Unable to determine exactly what happened, people referred to the abandoned settlement as "The Lost Colony." The first Discovery and Settlement of this Country was by the Procurement of Sir Walter Raleigh, in Conjunction with some publick-spirited Gentlemen of that Age, under the Protection of Queen Elizabeth; for which Reason it was then named Virginia, being begun on that Part called Ronoak-Island, where the Ruins of a Fort are to be seen at this day, as well as some old English Coins which have been lately found; and a Brass-Gun, a Powder-Horn, and one small Quarter deck-Gun, made of Iron Staves, and hoop'd with the same Metal; which Method of making Guns might very probably be made use of in those Days, for the Convenience of Infant-Colonies. A farther Confirmation of this we have from the Hatteras Indians, who either then lived on Roanoke Island, or much frequented it. These tell us, that several of their Ancestors were white People, and could talk in a Book, as we do; the Truth of which is confirm'd by gray Eyes being found frequently amongst these Indians, and no others. They value themselves extremely for their Affinity to the English, and are ready to do them all friendly Offices. It is probable, that this Settlement miscarry'd for want of timely Supplies from England; or thro' the Treachery of the Natives, for we may reasonably suppose that the English were forced to cohabit with them, for Relief and Conversation; and that in process of Time, they conform'd themselves to the Manners of their Indian Relations." Lawson, John (1709). A New Voyage to Carolina. University of North Carolina Press (1984). pp. 68–69. ISBN 9780807841266. A merging between at least some of the Lost Colonists and the Croatoan is a distinct possibility though not entirely documented. The partial English ancestry of the Hatteras People may had also come from later shipwrecks and marooned sailors. From the time of the disappearance of the Lost Colony in 1587 to the Battle of Roanoke Island in 1862, Roanoke was characterized by isolation due to its weather and geography. Sand shoals on the Outer Banks and the North American continental shelf made navigation dangerous and a lack of deep water harbor prevented Roanoke Island from becoming a major colonial port. The 1650 extinction date corresponds with the final war between the Powhatan Tribe and the Jamestown Colony that took place in 1646. Invaders from Virginia drove the Secotan Tribe out of Outer Banks region. Survivors of the English Invasion fled southwards and became the Machapunga. The Machapunga fought alongside the Tuscarora Indians against English encroachment in 1711. 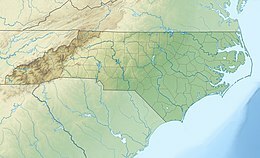 After their defeat most Machapunga settled and adapted to English lifestyle around Hyde County, North Carolina, other Machupunga fled northwards to join the Iroquois Confederation. The North Carolina descendants now live in the Inner Banks of North Carolina and continued to carry some native customs until 1900. Wood Engraving of early settlers arriving in costal North Carolina from 1713. With Roanoke Island open for settlement, English Virginians moved from Tidewater Virginia to settle in Northeast North Carolina's Albremarle Region. In 1665 The Carolina Charter established the colony of Carolina under rule of landowners called the Lord Proprietors. Carolina under its original name Carolana included the territory of modern North and South Carolina. Early organized English towns in North Carolina include Elizabeth City and Edenton. Pioneers crossed southwards across the Albremarle Sound to settle in Roanoke Island. They came primarily to establish fishing communities but also practiced forms of subsistence agriculture on the Northern parts of Roanoke Island. Most of the Pioneers had originally immigrated to the American Colonies from Southern English Paraishes such as Kent, Middlesex and the West Country. Upon the creation of the Royal British Province of North Carolina in 1729 Roanoke Island became part of Currituck County. During the rule of the Lord Proprietors Roanoke Island had been a part of the earlier Currituck Parish. It was during this time that historical families arrived including the Basnights, Daniels, Ehteridge, Owens Tillets,and others. There were no incorporated towns until Manteo was founded in 1899. From the 1650s to the Civil War period the Virginia settlers developed the distinct Hoi Toider dialect across the Outer Banks. The island was ill-suited for commercial agriculture or for a deep water port and remained isolated with little interference from outsiders. The nearby community of Manns Harbor came into being as a small trading post where goods were transported across the Croatan Sound. Unlike inland North Carolina the British authorities made no roads within or nearby Roanoke, the Tidewater region of North Carolina was avoided entirely. The development of Colonial Roanoke Island also depended on the natural opening and closing of inlets on Bodi and Hatteras Islands to its east. As in other times the Island was struck by deadly hurricanes. Thirty years later during the War of 1812 the British Royal Navy planned for an Invasion of North Carolina's Outer Banks, the invasion was aborted on Hattaras Island because there was nothing worthwhile for the British to occupy or pillage. The Invasion force then moved northward to attack Chesapeake Bay communities in Virginia. Roanoke Island continued its isolation until authorities of the Confederate States of America hastily prepared Roanoke Island to defend Coastal North Carolina from the invading Unionist Navy and Army. After passing by Cape Hatteras Union forces attacked Roanoke Island in 1862. Historical drawing depicting Union soldiers advancing through marshlands. During the American Civil War, the Confederacy fortified the island with three forts. The Battle of Roanoke Island (February 7–8, 1862) was an incident in the Union North Carolina Expedition of January to July 1862, when Brigadier General Ambrose E. Burnside landed an amphibious force and took Confederate forts on the island. Afterward, the Union Army retained the three Confederate forts, renaming them for the Union generals who had commanded the winning forces: Huger became Fort Reno; Blanchard became Fort Parke; and Bartow became Fort Foster. After the Confederacy lost the forts, the Confederate Secretary of War, Judah P. Benjamin, resigned. Roanoke Island was occupied by Union forces for the duration of the war, through 1865. The colony and Union troops had difficulty with overcrowding, poor sanitation, limited food and disease in its last year. The freedmen had found that the soil was too poor to support subsistence farming for so many people. In late 1865 after the end of the war, the Army dismantled the forts on Roanoke. In 1865, President Andrew Johnson issued an "Amnesty Proclamation," ordering the return of property by the Union Army to former Confederate landowners. Most of the 100 contraband camps in the South were on former Confederate land. At Roanoke Island, the freedmen had never been given title to their plots, and the land was reverted to previous European-American owners. In the aftermath of the Civil War the area which is today Dare County was still split between Tyrell, Currituck and Hyde. Roanoke remained a part of Currituck. Outside Interest in the history of the Roanoke Island took hold for the first time. The State of the North Carolina protected the historical Fort Raleigh Site that had been the location of the 1584 and 1585 English expeditions. N.C State Senator Zebulon Vance attempted to build a monument in honor of the Colony in 1886 but was rebuffed by Congress because the bill would have distracted attention from Plymouth, Massachusetts. The Town of Manteo grew as the center of business in Dare County, though it was not even the largest community in the county at the time. Buffalo City on the mainland had over 3,000 on the mainland but the community faded after the 1930s. Manteo while technically a new town was a combination of estates of landowners who had already resided on the island for two centuries. The organization of the town did spur new growth, as it became a central hub for the area. The waterfront become a bustling port with a network to Buffalo City, Edenton and Elizabeth City. Local fisherman, boat builders and landowners built fortunes whose wealth was later redistributed into new development. As seasonal tourists began to take interest Roanoke became more aligned with the national American culture. In 1917 the Pioneer Theater was established showing movies from around the country, the theater remains in existence as one of America's remaining small theaters. The transition from a wholly subsistence to a partial consumer economy began to gradually take place on the eve of the construction of the first bridge. Scene, of the Lost Colony. The theater production provided opportunities for young aspiring actors and employment for local Roanoke Island residents during the Great Depression and beyond. Both Manteo, in the north and Wanchese in the south were transformed by the construction of the first Nags Head bridge. Manteo which had previously been a small port reliant on trade with Elizabeth City and Edenton were connected to wider transportation network of North Carolina and the Virginian Tidewater region. The docks of Downtown Manteo began to decline as the bridge road became the center of commerce.Roanoke Island became industrialized for the first time in Wanchese. In 1936 the Wanchese Fish Cooperation was incorporated by the Daniels Family as a processing and packing plant for fish, scallops and shrimp. As Roanoke had been introduced in the national market economy by the bridge, and its fishing sales the local economy also suffered from the Great Depression. Another blow was dealt in the 1933 Outer Banks Hurricane that made landfall in Hatteras before moving northwards toward Nova Scotia. Over 1,000 people lost their homes across Eastern North Carolina and 24 fatalities were reported. The waterfront of Manteo was destroyed by a severe fire in 1939 as well. In response to the crisis, the New Deal came to Roanoke Island to provide desperately needed employment and to highlight Roanoke's importance for the history of the United States. The outdoor theater play The Lost Colony written by Paul Green began in 1936 and attracted the visit of President Franklin Roosevelt in 1937. The Lost Colony continues its performance every summer season. The onset of WWII with the German declaration of war in December, 1941 affected the island directly. In 2001, Dare County erected a marble monument to the Freedmen's Colony at the Fort Raleigh Historic Site. It is listed as a site within the National Underground Railroad to Freedom Network of the National Park Service. ^ Kupperman, John (1988). Captain John Smith, A selection of his writings. Wilmington VA: Institute of Early American History and Culture by the University of North Carolina Press. p. 94. ^ Dolan, Robert; Lins, Harry; Smith, Jodi (2016). "The Outer Banks of North Carolina". USGS Science for a Changing World. 2nd Edition: 50–52. ^ Stick, David; Dough, Wynne; Houston, Lebame. "Indian Towns and Buildings of Eastern North Carolina". National Park Service. Gov. Fort Raleigh National Historic Site. Retrieved 7 March 2018. ^ a b Taylor, Alan (2001). American Colonies: The Settling of North America. London, England: Penguin Books. p. 124. ISBN 9780142002100. ^ thatgirlproductions.net. "The Roanoke Voyages". thelostcolony.org. Archived from the original on July 15, 2010. Retrieved July 23, 2010. ^ Lawson, John (1709). A New Voyage to Carolina. University of North Carolina Press (1984). pp. 68–69. ISBN 9780807841266. ^ "Carolina - The Native Americans - The Machapunga Indians". www.carolana.com. Retrieved 2018-03-10. ^ "Algonquian Indians of North Carolina, Inc". ncalgonquians.com. Retrieved 2018-03-10. ^ "Carolana vs. Carolina". www.carolana.com. Retrieved 2018-03-10. ^ "Currituck County, NC - 1730 to 1790". www.carolana.com. Retrieved 2018-03-09. ^ "Ownership of Roanoke Island since 1669". www.ncgenweb.us. Retrieved 2018-03-30. ^ "Hoi Toiders | NCpedia". www.ncpedia.org. Retrieved 2018-03-10. ^ "The Royal Colony of North Carolina - Internal Roads as of 1775". www.carolana.com. Retrieved 2018-03-10. ^ "The American Revolution in North Carolina - Roanoke Inlet". www.carolana.com. Retrieved 2018-03-09. ^ "The American Revolution in North Carolina - The Known Battles and Skirmishes". www.carolana.com. Retrieved 2018-03-09. ^ "North Carolina - The War of 1812". www.carolana.com. Retrieved 2018-03-09. ^ "Dare County, NC - 1870". www.carolana.com. Retrieved 2018-03-13. ^ "Manteo, North Carolina". www.carolana.com. Retrieved 2018-03-13. ^ webmaster. "NCDOT: About the Ferry Division". www.ncdot.gov. Archived from the original on 2017-12-31. Retrieved 2018-03-21. ^ Kozak, Catherine (July 14, 2008). "Mother of all vines gives birth to new wine". Virginian Pilot. Retrieved July 15, 2008.